make it perfect: .Helpful blog post. So, when you leave a comment on my (or anyone else's) blog post, your comment will either be displayed as "anonymous" or with your profile name. All of the comments left on my blog also show up in my inbox. Unfortunately more than half of the comments that are left on my blog do not have an email address directly associated with them - which makes it really hard for me to reply to you or answer a question that you may have asked me! Go to your blog and click on the "Dashboard" link at the top of the page. 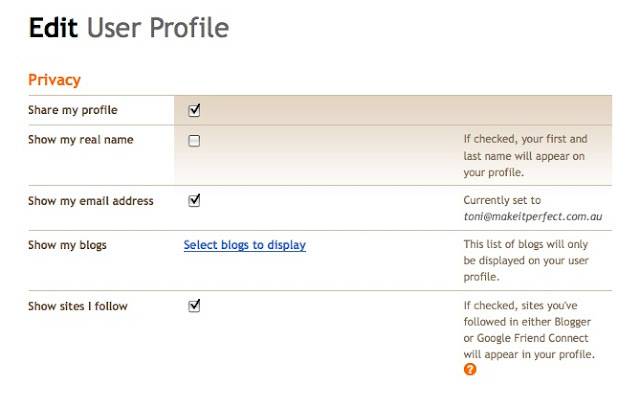 Even if you don't have a blog, you can still have a blogger account which you can leave comments from. Which will take you to the following page. In order for me to be able to reply directly to your comments, all you have to do is tick the box that says "Show my email address". Easy!! This doesn't mean that everyone will be able to see your email address, but does mean that when your comment shows up in my inbox, I can reply to you directly from my email. If you don't have a blogger account and are always leaving comments as "Anonymous" that is fine too, but if you want me to know who you are or would like me to answer a question, PLEASE type your email address into the comment. I often have people asking me questions about pattern availability, supplies used, etc. and most of the time I can't respond because I don't have your email address to reply to. I have had tonnes of people asking about purchasing my book overseas. Currently it is not available overseas, but should be sometime in the future. Yes, postage from my store is VERY expensive for New Zealand and the rest of the world. The book weighs almost 1.5kg which means it costs a lot for me to post. I have had a hunt around some online stores selling my book though and have found a few with quite reasonable postage rates. Thanks for all the great info - I'm bookmarking your post to link to the next time I have a giveaway, related to the no-reply bloggers. And thanks for the info about other places to purchase your book - Fishpond appears to have the best rates, but they have it listed as unavailable right now - so I guess congratulations are in order!! Woohoo!! I'll be trying to win copies of your book until it's available in Canada! I managed to find a copy of your book in Port Pirie SA at Megs books :) it's my birthday tomorrow and my mum had sent me some money so it's my birthday present. Only had a quick read through on the way home in the car but looks fabulous! Will do a blog review later in the week.